At the Wisconsin Historical Society in Madison, one of the greatest editorial projects in American history has been under way for nearly thirty-five years. Since 1976, the successive editors of the Documentary History of the Ratification of the Constitution have published twenty-three volumes, and there are at least eight more to come. These volumes contain every scrap of evidence the editors have been able to find relating to the debates over the ratification of the Constitution in 1787 - 1788. These editors, beginning with Merrill Jensen and continuing at present with John P. Kaminski, Gaspare J. Saladino, and others, have put together one of the greatest collections of debates over the basic issues of politics and constitutionalism that the Western world possesses. The political debates in fifth-century Athens or seventeenth-century England may have been richer and more wide-ranging, but we will never know, because the records of those earlier disputations are either lost or fragmentary. They are certainly not as complete as the records we have for the ratification of the Constitution. Rarely will we find a more profound or more comprehensive discussion of the problems of power, liberty, representation, federalism, rights, and all the other aspects of politics than we have in these volumes. This record is not only a national treasure, it is a world treasure. Pauline Maier, in her magisterial book on ratification, knows only too well the value of this documentary trove. She knows that she could not have written such a complete and colorful account of the process of ratifying the Constitution without the help of what she calls this “landmark editorial project.” Moreover, she points out that the documentary collection “lays the foundation for something of a revolution in our understanding of the ratification of the Constitution.” Unlike the other modern editions of the papers of the founding fathers—Washington, Jefferson, Hamilton, and so on—which deal almost exclusively with the world of elites, the ratification documents tell as well “the grass-roots story of the people and the Constitution.” The records reveal the thoughts and words not only of leaders such as Hamilton and Madison, but also of lesser-known figures such as William Findley of Pennsylvania and Melancton Smith of New York. And more: they preserve also the voices of backbenchers such as Samuel Thompson of Maine and John Dawson of Virginia, of whom few historians have ever heard. The breadth and depth of popular interest in the Constitution was extraordinary. The towns of Massachusetts elected 370 delegates to the state’s ratifying convention, of whom 364 attended. It took six days for the delegates from Bath, Maine (then part of Massachusetts) to make their way across rivers and through snow to Boston. The town of Richmond in the far west of Massachusetts held four meetings in December 1787 at four different times and places to discuss the Constitution, and on Christmas Eve finally voted that it was “not proper to adopt the Constitution as it now stands.” Interest in the Constitution in Richmond, Virginia was equally intense. The fledgling state capital had trouble accommodating not only the 170 delegates to the ratifying convention, but also what one observer called the “prodigious number of People from all parts of the Country” who wanted to witness the debates. Maier sees this book as flowing logically from her earlier work. She began her career with From Resistance to Revolution: Colonial Radicals and the Development of American Opposition to Britain, in 1972, which described the way local resistance organizations evolved into a movement for independence. In The Old Revolutionaries: Political Lives in the Age of Samuel Adams, in 1980, she wrote brief portraits of the men who led the resistance. Then in American Scripture: Making the Declaration of Independence, in 1997, she analyzed the state and local “declarations” of independence that preceded and made possible the familiar Declaration of Independence adopted by the Continental Congress on July 4, 1776. Her decades-long exploration of the local and popular foundations of politics in the Revolutionary era seems to have led her inevitably to this book on the people and the Constitution. Ratification is a splendid climax to a distinguished career, though Maier is quick to point out that she is not ready to quit just yet. Since Maier wishes to recover as closely as possible the way ratification happened, she frames her history as a chronological narrative of the process, which began in November 1787 and lasted until the summer of 1788. 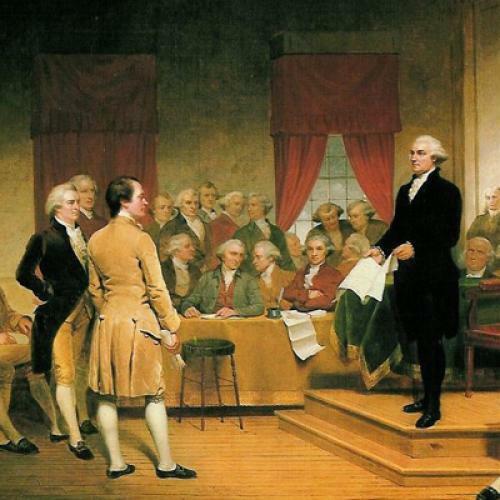 Although Pennsylvania began debating the Constitution at its ratifying convention on November 21, 1787, before any of the other states, its debates went on until December 15. In the meantime Delaware met on December 3 and unanimously ratified the Constitution on December 7, becoming the first state to do so. New Jersey and Georgia quickly and unanimously ratified before the end of 1787. In early January 1788, Connecticut approved the Constitution, 128 to 40. After much debate, Massachusetts ratified in early February, 187 to 168, and proposed amendments. At the end of February the New Hampshire convention adjourned without ratifying. A month later the citizens of Rhode Island voted directly to reject the Constitution, 2,708 to 237. On April 26, 1788 the Maryland convention approved the Constitution, 63 to 11. A month later South Carolina ratified 149 to 73, and proposed amendments. On June 21, a reassembled New Hampshire convention ratified, 57 to 47, the ninth state to do so; it also proposed amendments. Since Article VII of the Constitution declared that the Constitution would go into effect when nine states ratified, the Continental Congress on July 2 appointed a committee to plan the transition. On June 25, Virginia ratified, 89 to 79, and proposed amendments. On July 26, New York ratified by the close vote of 30 to 27, and proposed amendments along with circular letters to the other states calling for a convention to consider the amendments. On August 2, North Carolina proposed amendments but refused to approve the Constitution. In mid-September, the Congress set a date for the presidential elections and the meeting of the new Congress. State by state in chronological order, Maier takes us through this ratification process in full and rich detail. Although historians will continue to write about ratification, it is unlikely that anyone will duplicate what Maier has done. Although she tells us about every state, she concentrates on the struggles in the big and important states of Pennsylvania, Massachusetts, Virginia, and New York. She records what the people in each state felt about what they had learned from previous ratifications, but never does she reach ahead to the outcome. She wants us to experience events the way people at the time did, with all the sense of contingency, fear, expectation, and hope that they felt, not knowing the future, not knowing whether the Constitution would be ratified or not. In Pennsylvania, the supporters of the Constitution—the Federalists, as they called themselves—sensed that time was not on their side and attempted to rush the process of ratification, using ham-handed techniques to prevent critics of the Constitution from being heard. The initial publication of the debates in the state’s ratifying convention printed only the speeches of the Federalists, as if there were no opposition whatsoever. When another editor began printing a fuller record of the opposition’s speeches, the Federalists pressured the owner of the paper to fire him. It is amazing that we have any record at all of what the critics of the Constitution said. The Federalist victory in Pennsylvania was so crudely achieved that it endangered ratification elsewhere. Suddenly, on January 30, Governor John Hancock, who had been elected the convention’s president but was too sick, or so he said, to attend the proceedings, rose from his sickbed and was carried into the convention wrapped in flannel. Apparently the Federalists had convinced him of full-fledged support for the governorship in the next election, and suggested that in case Virginia failed to ratify, thus disqualifying Washington for the presidency, he was a likely choice for the office. So on January 31 Hancock dramatically abandoned his previous hesitancy and urged ratification with a recommendation that the first Congress push for amendments. Maier covers the Virginia and New York conventions in equal detail and with equally colorful stories. In Virginia, the situation was especially tense. Although it looked as if nine states might ratify before Virginia, there could be no real United States without the biggest, most populous, and richest state being included, or so Patrick Henry, probably the greatest orator in the country, declared. Henry saw nothing good whatsoever in the proposed Constitution, and with his scattershot attacks on the document he “in effect,” writes Maier, “hijacked the debates.” On the eve of the vote Henry attained his rhetorical high point, claiming that he could even see “beings of a higher order, anxious concerning our decision.” Suddenly a violent thunderstorm shook the hall, and Henry was forced to stop. But despite seeming to have the heavens on his side, on the following day, June 25, Henry and the opposition failed by ten votes to prevent ratification of the Constitution. New York promised to be even tougher than Virginia, for the leading opponent of the Constitution in the country was George Clinton, the state’s governor. So state-centered was the political climate in New York that two of its delegates to the Philadelphia convention that drafted the Constitution had walked out as soon as they had sensed that, instead of amending the existing Articles of Confederation, as was expected, the convention was determined to abolish them and create an entirely new national government. Unlike in most states, the newspaper opposition to the Constitution in New York was formidable. In order to justify the Constitution, the authors of The Federalist Papers, Hamilton, Madison, and John Jay, had their work cut out for them. Their essays were directed primarily at New Yorkers; only twenty-four of the eighty-five Federalist Papers were re-published outside New York during the ratification controversy. The Federalist, Maier rightly observes, was anything but the “dispassionate analysis of the Constitution” that many later came to believe it was. Instead, it was mainly directed at the arguments of the Constitution’s opponents in New York. Maier gives proper credit to Melancton Smith, one of the most brilliant of the opponents. A small-time merchant from an undistinguished family and with no college education, he nonetheless held his own in the New York convention against the sophisticated oratorical talents of Alexander Hamilton and Robert R. Livingston. Smith is probably the author of the Federal Farmer, the most impressive of the anti-Federalist publications. He kept the debate in New York at a high level. No debater in any of the conventions probed the issue of representation more deeply than he did. In particular, Smith urged that representatives had to be not only for the people but also of the people. Only middling men—farmers, artisans, and so on—could speak for middling people. High-flying college-educated lawyers could never represent ordinary folk. Again, Maier takes us through the lengthy New York debates and multiple motions and resolutions, building suspense over whether the Federalists would prevail in a convention that seemed decidedly opposed to the Constitution. Since news of New Hampshire’s ratification had little effect, the Federalists counted on Virginia’s ratification, news of which reached the convention on July 2, to influence the outcome. The “Antis,” as the critics were called in New York, ignored Virginia’s ratification and continued to offer amendment after amendment. The Federalists stopped debating and watched as their opponents essentially re-wrote the Constitution. But the anti-Federalists began to divide, some wanting to reject the Constitution outright, others willing to ratify it only on condition of its being amended, and still others accepting it with recommended amendments. The fact that ten states had ratified, and so the new federal government was going to be established no matter what New York did, had changed the issue. Now it was a question of being in the union or not. In the end, the impracticality of being outside the union brought enough Antis, including Smith, over to ratification, which was accompanied by a circular letter and a long and complicated series of amendments recommended, but not required. After nearly six weeks of tortuous debates, the Constitution carried by only three votes. Maier is as honest and as fair-minded as any historian writing today. As in her earlier work on the Declaration of Independence, in this book on ratification she is the complete contextualist, scrupulous in fixing ideas and events in their own time and place, and in keeping all present-minded concerns from affecting her recovery of the past. She realizes that most of us today have an unconscious—or perhaps not so unconscious—bias toward the winners in the ratification process. Since, among other things, the Federalists provided the intellectual foundations of American government, “we tend,” she says, “to believe everything they said.” Besides, “the Federalists were intelligent and articulate, the kind of people with whom historians tend to identify and so to trust.” What they said in the debates over ratification “seems wise and persuasive, which is to say true.” Moreover, notes Maier, the Federalists controlled the documents on which historians depend. They owned most of the newspapers and often prescribed what parts of the convention debates were to be published. In Pennsylvania, they even tried to suppress negative opinions about the Constitution. Since the historical record has been so loaded in favor of the Federalists, Maier seeks to redress the balance. She conscientiously avoids calling the opponents of the Constitution “Anti-Federalists,” since that term was foisted on them by the Federalists and was not usually used by the critics of the Constitution in referring to themselves. “To use the Federalists’ language—to tell the story in their terms—tends to give them the game, or at least to tip the story further in their direction.” She quite rightly points out that the struggle over the Constitution was never a neat two-sided contest. “Critics of the Constitution,” she says, “did not speak with one voice.” They were numerous, and they ranged along a spectrum of opposition, from those such as Luther Martin, who wanted to cling to a reformed Articles of Confederation, to those such as Elbridge Gerry, who wanted the Constitution ratified but with amendments. Many of the critics were localists who feared that the Constitution would create the very kind of far-removed and powerful central government that they had just thrown off. They worried also that elections were too infrequent, especially for the Senate. They thought that representation in the House, sixty-five members for four million people, was inadequate. The president was too monarch-like, and the Constitution lacked a provision for jury trials in civil cases. Some were frightened by the distant ten-mile square that was to become the capital. The federal government would become a consolidation run by an aristocracy, “lordly and high-minded men” contemptuous of the common people. Like the present-day Tea Partiers, mistrust of politicians ran through all their speeches and writings. Since no one should be counted on to exercise political power fairly, many critics proposed term limits. In framing a new government, the Anti-Federalists declared, “it is our duty rather to indulge a jealousy of the human character, than an expectation of unprecedented perfection.” One Massachusetts delegate said that “he would not trust ‘a flock of Moseses’” with political power or with too much revenue. “As the poverty of individuals prevents luxury,” one Anti-Federalist observed, “so the poverty of publick bodies ... prevents tyranny.” Above all, the opponents wanted a bill of rights to limit the government and protect their rights. Although Maier is too serious a historian—too wedded to the pastness of the past—to attempt to connect these sorts of localist attitudes and social resentments to our own time, what is extraordinary about much of the Anti-Federalist thinking is its similarity to the populist sentiments that we are experiencing today. All of which suggests that the present-day Tea Party movement may not be as novel and strange as some think it is. The great irony, of course, is that the Anti-Federalist ancestors of the Tea Partiers opposed the Constitution rather than revered it. Gordon S. Wood is Alva O. Way University Professor Emeritus at Brown University. His most recent book is Empire of Liberty: A History of the Early Republic, 1789 - 1815 (Oxford University Press). This article ran in the December 30, 2010, issue of the magazine.